It can seem somewhat unnecessary to debate player of the year awards this far in advance, but we’re all dying for football, so let’s have fun. And if there’s any major award like this that makes sense to discuss so early though, it might be the Heisman Trophy. Typically have an idea of which players have progressed enough to be in the conversation for the honor in any given year. The list may include 10 or 15 players, but it’s become somewhat rare that someone completely unexpected enters the conversation. For instance, the tight race for 2018’s Heisman produced a narrow win for Kyler Murray, but ultimately came down to the two players many thought might be in the mix (Murray and Tua Tagovailoa). The typical lack of surprise actually makes it worthwhile to look ahead for the Heisman. Right now, Clemson’s Trevor Lawrence and Alabama’s Tua Tagovailoa appear to be runaway favorites. It would, at this point, be a surprise if neither quarterback wins the award. Looking at possibilities beyond the very top of the list though, here are a few Big 12 standouts who could be in the conversation come fall, or even midseason. Hurts will be Oklahoma’s quarterback after transferring from Alabama, where he had several chances where he looked like a championship-level QB (2018 SEC Championship Game), just not quite as good as Tagovailoa. He’ll have every chance to become a national sensation leading a top-tier program with College Football Playoff aspirations. College football’s prediction markets for betting interests aren’t particularly active right now, but it’s interesting to note that some early odds on the Heisman have factored Hurts in as the best of the “other” options beyond Lawrence and Tagovailoa. Ehliinger is probably the league’s most realistic option outside of Jalen Hurts, and he’s certainly in position to put together a Heisman-level campaign. He’s a legitimate dual threat quarterback, having run for 16 touchdowns in 2018 in addition to passing for 25 (with only five picks). 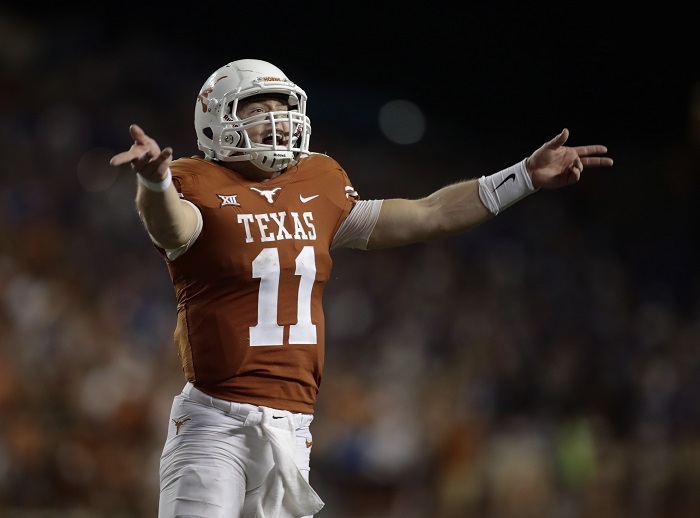 Ehlinger has a lot of pressure on him, because his play to close out the season – and in a bowl game win over Georgia – has Texas fans eyeing the College Football Playoff. If he is able to handle the pressure, he’ll certainly be on the short list. Bowman is a little bit more of a long shot, but because he’s a young player heading into his sophomore season, we’ll note that he has the potential to really explode as a statistical giant. Bowman topped 2,600 yards last season despite only playing eight games, and clearly has the talent to sustain that kind of production over the course of a full season. The real question is whether he can better it and keep that momentum going under a new coaching staff led by Matt Wells. Bowman himself, for what it’s worth, has already proclaimed that he’s going to be unstoppable.